Warning to owners who use pill splitters for pet medications. Our doctors have become aware of a dangerous accident that can happen when using a pill splitter to prepare your pet’s medications. Pill splitters use a razor to cut tablets. 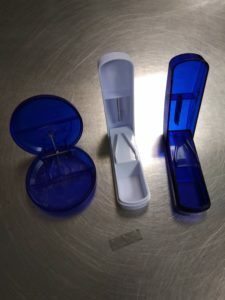 It may be possible for the razor to become dislodged during normal use resulting in accidental ingestion of the razor depending on how your pet’s medication is administered. We recommend careful inspection of your pill splitter before and after each use. Never use a pill splitter that is worn or damaged and if damage is discovered after use make sure to inspect your pet’s medication before administration. Your pet’s safety is important to us. Take an extra moment to check, for their sake.